Baku will host the first meeting of the working group for implementation of the Convention on the Legal Status of the Caspian Sea to be held Feb. 19-20 with the participation of representatives of the Caspian littoral states, Trend reports with reference to Azerbaijan’s Foreign Ministry Feb. 8. 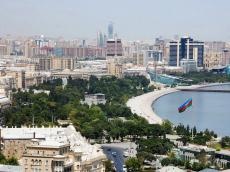 A number of issues arising from the Convention, as well as the results of the Fifth Summit of the Heads of the Caspian littoral States in Aktau, are expected to be discussed at the meeting. At the event, Azerbaijan will be represented by the delegation led by Khalaf Khalafov, chief of the Staff of the Cabinet of Ministers of Azerbaijan and the representative of Azerbaijan in the High-Level Working Group for the Caspian Sea. On August 12, 2018, the "Convention on the Legal Status of the Caspian Sea" was signed in Aktau, Kazakhstan and the Communiqué of the Fifth Caspian Summit was adopted. Based on these documents, in order to effectively implement the Convention and review cooperation issues in the Caspian Sea, the High-Level Working Group for the Caspian Sea has been established as a regular five-sided consultation mechanism consisting of authorized representatives of the Caspian littoral states.